Team P is still on the road for the Great Holiday Cross-Country Tour, but I just wanted to quickly show you one last bit of Christmas décor. Remember how I showed you the very, very (no really, VERY) simple holiday styling for our mantle? 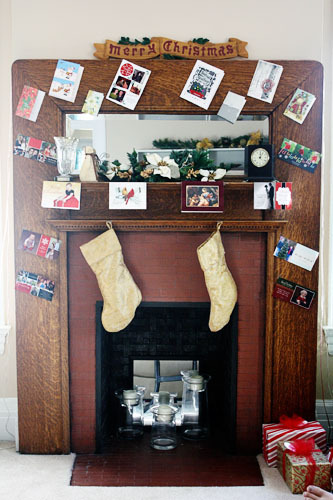 Last year I decorated our mantel with Christmas cards, which is the most fun and sentimental way to decorate a mantel, in my humble opinion. However, I expected we wouldn’t get many Christmas cards this year, mostly because I was late sending out our own cards – which, if you’ll recall, were also serving as our change-of-address cards. I threw those up there with scotch tape, which shouldn’t damage our antique mantel, the day before we left on our travels. (Even the stockings are scotch-taped up there, because lazy.) You guys, that’s what finally got me in the Christmas spirit. It’s just doesn’t feel like Christmas without Christmas cards! Thank you, friends and family, for this delightful part of the holidays.